The dramatization of the hunt for Osama Bin Laden from September 11, 2001 to his death in 2011, Zero Dark Thirty is a gripping slice of history. A modern war detective story set in the world's most dangerous neighbourhoods, the film is as unrelenting as the intensity of the chase to locate the world's most wanted man. Two years after the terrorist attacks of September 11, Central Intelligence Agency operatives are interrogating detainees at black sites around the world. Veteran agent Dan (Jason Clarke) is working on detainee Ammar (Reda Kateb), using a combination of intimidation and outright torture, when Maya (Jessica Chastain) joins the interrogation. A relatively young agent on her first assignment, Maya dedicates herself to the hunt for Bin Laden, working alongside a team that includes Dan and Jessica (Jennifer Ehle). Eventually, Ammar mentions the name of Abu Ahmed, a trusted courier in Bin Laden's Al-Qaeda network. Maya follows-up on the testimony of other detainees and finds several other mentions of Abu Ahmed, but his location remains a mystery, and eventually the trail runs cold. Meanwhile, large scale terror attacks continue, including in London, Saudi Arabia and Pakistan. A CIA misstep causes painful losses in Afghanistan and reports surface that Abu Ahmed may be dead. Eight years after she started the hunt, Maya receives fresh information that reinvigorates the case, and painstaking surveillance commences to find the elusive courier and determine if he has direct access to Bin Laden. Zero Dark Thirty dispassionately presents the infamous torture of detainees as part of the history of chasing Bin Laden. The film neither glorifies torture nor apologizes for it. The scenes are not easy to watch, neither director Kathryn Bigelow's camera nor Maya looking away from the beatings, simulated drownings, confinement in a tiny box, and humiliation with a dog leash. As one of the many tools used for better or for worse in a desperate man-hunt, the torture is there, along with painstaking detective work, countless hours of watching videos, intelligence reports from other agencies, wire-tapping, and most essential of all, front-line, on-the-street surveillance. The tortured detainees do eventually give up the name of Abu Ahmed, Bin Laden's courier. Crucially, the information is muddled: in the interrogations the wrong photo is attached to the right name. More crucially, clearer, critical information about Abu Ahmed was always readily available from other non-detainee sources, but in the flood of incoming post September 11 data, that file languished unattended for years. And most important of all, the key Abu Ahmed information was only followed-up on years later, a clear counter to the argument that the essential information provided by torture victims may be necessary to thwart imminent attacks. Bigelow and screenwriter Mark Boal are saying that yes, torture may yield information, but look around: it may be unreliable, it may already be available through other methods, and it may not lead to any quicker resolutions. Jessica Chastain as Maya, supposedly based on a real-life agent but more likely a composite character, stands tall for the nine year manhunt. While others get distracted by sideshows, shifting political winds, the passage of time and fading memories, Maya maintains focus on a singular mission. Chastain finds the necessary mental steel within the woman to survive in the most brutal of worlds, portraying Maya not as a physical hero but in possession of remarkable tenacity and emotional control. Chastain is a picture of intense composure from the interrogation black sites to the military bases in Afghanistan and the equally inhospitable jungle of the US Embassy in Pakistan, occasionally showing flashes of discomfort, impatience and temper, but always coming back stronger for yet another crack at assembling the Bin Laden jigsaw puzzle. The final 40 minutes of Zero Dark Thirty feature a re-staging of the Navy Seals' mission to storm a fortified house in Abbottabad, Pakistan. 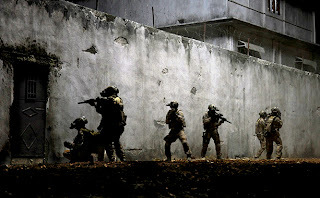 The film's name is the military reference to half past midnight, when the raid was launched with orders to kill Bin Laden if indeed he is at the house, as there was no assurance that America's number one enemy was the mysterious man protected by the high walls. While history is often better appreciated from afar, Bigelow places the end of Bin Laden in the context of a tense, high-risk climax to the nine year search for the man who declared war on a superpower and destroyed its symbol of commerce, only to have his part in the war abruptly ended in his own bedroom. With a new kind of war being played out without front lines, Zero Dark Thirty captures the reality of a conflict where the few rules are defined by shifting moral compasses, the enemy is only seen during suicidal actions, and successful brutality instigated by both sides is tempered by the assurance that it will surely only encourage more retaliatory killing in a race to the dehumanized bottom.